Cedar Stars Academy were flying high in the W column of the CSL, riding a dreamlike 12 match winning run. It took a swarm of saves from an in-form goalkeeper to snap the Stars’ winning streak. 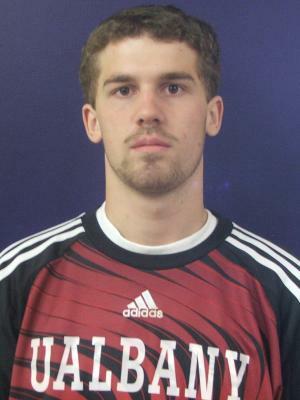 NY Greek American shotstopper Bradley Johnson racked roughly 12 saves versus CSA to lead his side to a 1-1 draw. 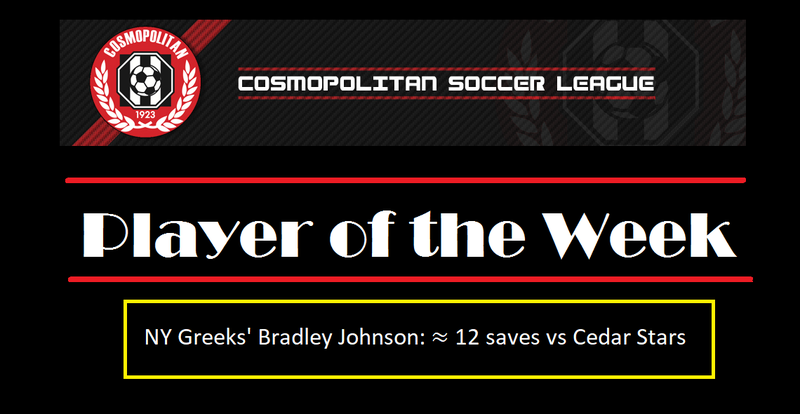 Johnson won Round 18 Player of the Week for his heroic goalkeeping display against Cedar Stars. “It certainly took a top performance to hold Cedar Stars to that result,” Johnson said. The former University at Albany star keeper later added: "Definitely this is one of my best games of the year, I had two top class saves versus Phil Bannister." It’s the Manhattan native’s first time winning the award. But it’s the second time a goalkeeper was nominated Player of the Week in the modern of the league as CSA netminder Bryan Lopez bagged the accolade in Round 15. Johnson shared that he’s at the prime of his CSL career and was thrilled to add his name in the list of Player of the Weeks. Johnson’s arguable best save of the encounter came in the second half when he performed a reaction-block with his left shoulder from Bannister’s shot in the 6-yard box. The keeper noted that it was “one of [his] top saves in a while.” Unfortunately for Johnson, his highlight reel save led to the corner NY Greeks conceded the goal from. The American’s second best stop was against his friend Bannister again. It happened in the first half when he stretched on his right to firmly grasp Bannister’s one-time hit from about 12 yards out. Two more mesmerizing plays from Johnson in the first half was when he dove backyard to swat a corner kick over the net, with two Cedar players waiting to head the ball and when he dove forward to palm away CSA’s left winger’s sizzling hit driven the bottom near post. Johnson couldn’t help to express how fond he is of goalkeeping after his plethora of saves against Oliver Papraniku’s men. The keeper also praised the defenders in front of him, expressing how valuable they are in his recent success. “I’m most satisfied with the Greeks' recent commitment to defending and playing hard,” Johnson said. “This result would not have been possible against such a dominant team without amazing defensive plays and work rate, and it has been getting better with each game through the Spring. Johnson’s performance versus CSA wasn’t his only noteworthy match this season. The LIU assistant coach has been superb between the sticks for the Greeks throughout the second half of the season, tallying four clean sheets in seven matches. Two of his most notable performances in the Spring season before his side’s game against Cedar were a 10-save display versus NY Shamrock SC in a 3-1 win on May 6th and he held amateur champions Lansdowne Bhoys scoreless with five saves on April 25th. NY Greeks will play reigning Manning Cup champions Lansdowne in the tournament’s final in June. And for the CSL playoffs, as things stand now in the table, NYGA’s opponents are Cedar Stars. But in the near future, Johnson’s next game with NY Greeks is versus NY Athletic Club on Thursday, May 17th, at Randall’s Island Field 10 at 7:00 p.m.